I am reaching out to the PRI community to inform all Dallas residents that I am starting a PRI peer mentor group. The intent is that we have monthly or bi-monthly in-person meetings to provide a quality opportunity for learning. If anyone is interested in joining the group, feel free to shoot me an email at john.hfap@gmail.com. 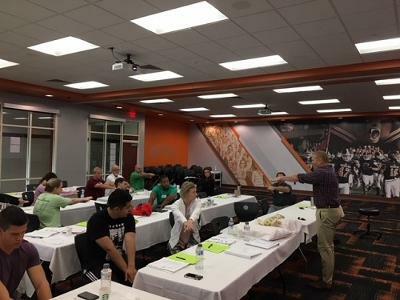 Mercer University in Macon Georgia played host to the Postural Restoration Institute as I was there to teach one of my favorite classes: Impingement and Instability. Macon is about 90 miles south of Atlanta and was the home to the Allman Brothers Band, Little Richard, Otis Redding and a ton of other incredible and famous musicians and bands. Macon is in the heart of Dixie and Mercer is a phenomenal University with an outstanding Athletic Training and sports medicine department. Amos Mansfield ATC is the head athletic trainer at Mercer and he was our host. Amos did a fantastic job and he continues to work on his PRT status because he has seen what he is capable of doing with PRI science. We had 22 professionals in class and the course went very well. Many of the gang are also pursuing PRC or PRT status. I&I is a super fun class that takes a really deep dive into the neuro-mechanics of postural discord. It is a class that is advanced and fun to negotiate as it seems to morph into a different iteration each time it is taught. Kenny Ishii flew over from Japan and provided some valuable insight as he wrapped his head around the I&I concepts in preparation to teach this class in Japan in the coming years. Jason Robey was also on hand in the class and I always appreciate his input. Incidentally, Jason just defended his doctoral thesis and it’s all about PRI! Further, Mercer University and Amos Mansfield created a setting that was tailor made for learning. I am a little prejudiced since I do some work at Mercer and I am very proud to be affiliated with them. I hope that those of you who haven’t taken Impingement and Instability will consider it in the future. The secondary courses at PRI are so very valuable at putting the pieces from the primary courses together in a meaningful way. That’s how one of the course attendees put it in their summary! I look forward to seeing you soon in the next class!! PRC Applications Due in Less Than Two Months! Summer is nearly half over, which means Fall is quickly approaching, and PRC applications will be due soon! Reminder that the Postural Restoration Certified (PRC) credentialing program deadline is September 15th. The PRC credentialing program is limited to the first 30 applicants each year. Two copies of each application (including full text of the articles used in the article review portion) must be mailed to PRI, and received no later than September 15th to be considered for testing this December. Please be sure that all items on the PRC application checklist are submitted. Please note that the PRC application is updated each year, so please print the most up to date application. To print an application, CLICK HERE! PRC testing is scheduled for December 10-11th (following the four day Advanced Integration course) in Lincoln, NE. *International clinicians who are interested in applying should contact me ASAP, as additional educational information must be submitted by August 1st (extended from July 15th) for review and approval by the PRI Board of Directors to determine eligibility for the PRC credentialing program. 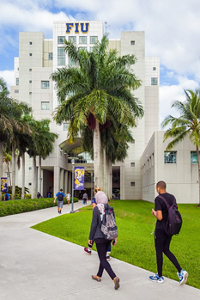 Are you planning to apply this year? If so, please let me know! Also, if you are preparing your application, and have any questions, please call or email me! 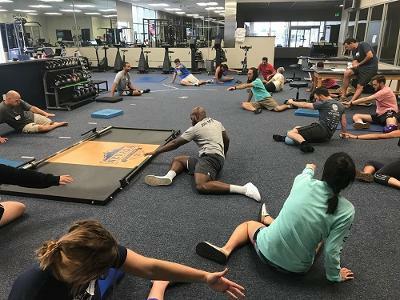 We are excited to announce that Certified Special Population Specialist (CSPS) fitness professionals are now eligible to apply for our Postural Restoration Trained (PRT) credentialing program. In addition to holding this certification through the NSCA, one must also have completed a Bachelor's degree or higher degree in order to apply for PRT credentialing. According to the National Strength and Conditioning Association, Certified Special Population Specialist's are defined as "fitness professionals who, using an individualized approach, assess, motivate, educate, and train special population clients, including those with chronic and temporary health conditions. Become a certified personal trainer, then pursue this advanced personal trainer certification. 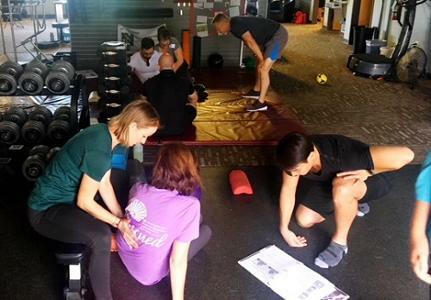 CSPS® individuals train clients with medical conditions such as metabolic disease, autoimmune disorders, cancer and cardiac arrest, and address the needs of prenatal and postpartum personal training clients." The Postural Restoration Trained (PRT) credentialing program was established in 2011, as a way to recognize and identify individuals with advanced training, extraordinary interest and devotion to the science of postural adaptations, asymmetrical patterns and the influence of polyarticular chains of muscles on the human body as defined by the Postural Restoration Institute. Postural Restoration Trained (PRT) is a credential available to Athletic Trainers (with Certification through the BOC), Athletic Therapists (with Certification through the CATA), Strength and Conditioning Coaches (with CSCS Certification through the NSCA or SCCC Certification through the CSCCa), Certified Special Population Specialists (with Certification through the NSCA, and completion of a Bachelor's degree or higher degree), and Exercise Physiologists (Certified Exercise Physiologists, Certified Clinical Exercise Physiologists, and Registered Clinical Exercise Physiologists with Certification through the ACSM) who have attended PRI courses, demonstrated a thorough understanding of the science through completion of the PRT Application and successfully participated in both clinical and analytical testing. To learn more about the PRT credentialing program, CLICK HERE! Hruska Clinic 2018 shoe list is live! Lori Thomsen and the staff at The Hruska Clinic have recently updated their shoe list for summer of 2018! We have tried to provide more categories to assist finding proper footwear depending on the primary issues that you may be adressing with your patient. We hope that his gives patients and practitioners better tools to assit their patients. See the Hruska Clinic website to download the shoe list and see a video from Lori explaining what went into the changes this year!